It's one layer week over at Less Is More and this week we have a fabulous theme for you - Outlines! After a good root through my stash I found these mini blueprint stamps from Tim Holtz.. Perfect! There are some amazing samples from the DT so please check them out. After a very busy week (crazy after a week off work) I'm hoping life calms down a bit this week so should get to visit a lot more of you. I'm still not sure where 2016 has gone! Id always forget we can use black and still have "white" space. Adorable robot image. Love this robot...this is the prefect challenge to us this stamp! 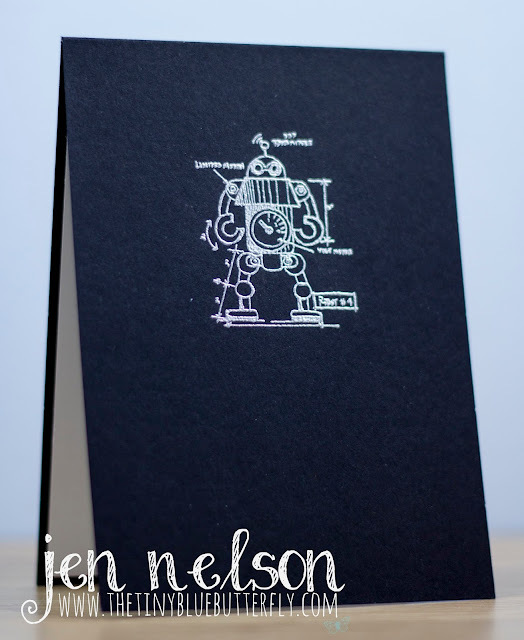 Super card Jen, such a good idea to use the blueprint stamp! It's a very stylish but fun end look. Fab! No, no-one knows where the year has gone, I do hope 2017 slows down. The little robot is perfect on the blue background, very smart. Christmas Tradition.. The Tree is Up!